4 Steps to Practice Interviewing Before Your First Interview. Interviewing 101: A few resources for teaching undergrads how to interview for Public-facing Digital Projects. Within One Term. The X-Factor: What Happens When the Interview Breaks Down? Why Aren’t All Interviews Done On Video? 1- Introduction to OHMS: Why use this tool? Develop and publish an online resource hub for oral history and digital scholarship/storytelling framed in three parts— Practice (pedagogy for engaging in community), Analysis (pedagogy for building, exploring, & excavating the archive), and Publication (pedagogy for impactful storytelling)— using ‘high impact’ and experiential learning frameworks. Establish and promote workflows and technological options for visualizing, processing, preserving, and sharing field recordings that result from community-based learning. This initiative aims to promote access to collaborative project spaces and long-term archival options for audio and video-recorded cultural documentation, using platforms such as the Internet Archive, the Oral History Metadata Synchronizer (OHMS), PopUp Archive, Stories Matter, and StoryMaps. Promote and recruit applicants for a series of Call for Proposals to provide micro-funding and support for demonstration project teams from GLCA colleges to ensure adoption of the toolkit, trainings, and repository options curated by the initiative. Devise and enact outreach strategies across teaching-focused campuses, and coordinate trainings and workshops. Within the GLCA Expanding Collaboration Initiative, OHLA grows out of the Digital Liberal Arts conference held in Ann Arbor in the Summer of 2014. It meets the GLCA priorities of alternative approaches to pedagogy and learning as it aims to create a High Impact Practice framework for experiential teaching and community engagement that animates liberal arts learning outcomes. It could also be seen as a building resources and capacity for collaboration initiative as it will promote replicable project models and technology stacks/workflows using open source digital tools— surmounting many of the obstacles for collaboration across GLCA-affiliated campuses. While this project originates within the GLCA network, it is open to collaboration beyond the bounds of the consortium. Higher education is in a period of intense introspection and educators are striving to find new means to achieve greater outcomes and more deeply engage students in their educational experience. Across teaching-focused campuses, faculty are challenged to innovate and experiment with pedagogies outside or beyond the centuries-old lecture format (which research suggests too often fails to engage first-generation students and those from underserved communities) into something more interactive and immersive. To make higher education more meaningful and experiential, the Association of American Colleges and Universities (AAC&U) recommends curricular development of “high-impact practices,” or HIP, to increase rates of student retention and student engagement. These recommendations include first-year seminars, collaborative projects, undergraduate research, community-based learning, and capstone projects. While AAC&U has published a variety of rubrics and other literature as resources to support high impact practices, it maintains that “the utilization of active learning practices is unsystematic” on almost all campuses. The purpose of this initiative is to develop a systematized, sustainable, supportive pedagogy for active HIP learning using oral history methods to gets students out of the classroom and into the community. Oral History is generally defined as a methodology for conducting interviews, curating the result of those interviews, and making those interviews available for research, in accordance with the best practice guidelines established by the Oral History Association. Digital Scholarship is the process of using digital tools and platforms to investigate, arrange, and analyze oral histories, texts, data sets, and archival records. Digital Storytelling refers to the process of creating documentary stories for a public or chosen audience from a variety of digital source media— including archival imagery and edited narratives from oral history interviews. OHLA will publish a major pedagogical resource presenting oral history as a robust interview methodology that, when combined with digital scholarship and storytelling, can be integrated into classroom and cooperative education curricula for rich community-based inquiry that is guided by a course’s subject matter. For brevity, the term “oral history” in this proposal refers to all of the above as an interconnected set of tools for high impact inquiry and engagement in undergraduate learning. As such, rather than imagining an audience of oral history practitioners or digital humanists, the resources created by this initiative aim to be of broad use to all faculty considering engaging students in their local community or in communities of practice— the English instructor connecting themes in her American Literature course to contemporary migrant farm workers in the surrounding community; the chemist recording the social history of advancements in the field; the math instructor attempting to make geometry relevant to daily life; the student interning over summer term attempting a fieldwork research term in advance of their senior project sequence. OHLA considers the broadest possible audience and engagement, and does not see the skills as the ends in themselves. OHLA sees oral history and digital storytelling/scholarship skills and methods as tools to animate learning outcomes, to drive curriculum towards innovation and participatory, high impact pedagogical strategies. The practice section of the OHLA toolkit will be a synthesis of existing literature and best practices, engaging faculty in new and exciting opportunities for teaching, research, and community engagement while helping faculty navigate the legal, ethical, and programmatic structures that frame engagement with students in institutional settings. Along with topical chapters and case studies authored by group members, the toolkit will feature an extensive addendum of materials, including best practice statements, a project statement template, an interviewee biographical information form, an “informed accessioning form,” informed consent documents, and a deed of gift form. Also included will be lesson plans for teaching oral history practices, including interviewing, sound and/or video recording, and engaging with traumatized communities. The archives and analysis portion of the toolkit will provide pedagogical resources for engaging students in developing rich, navigable, multimedia archive collections, producing transcriptions using current best practices, and visualizing and analyzing data. Curriculum resources could include ‘learning modules’ that forward integration of the archives into liberal arts curriculum, curated and annotated lists of extant digital tools for analyzing archives, lesson plans for teaching best practices in oral history data analysis and visualization, and rubrics for assessing student work in this area. The publication section of the toolkit is conceived as two things: a theoretical discussion of what scholarly publishing looks like when faculty are employing digital-era oral history methodology and a resource of tools, platforms, and tried-and-true technology stacks and associated workflows. Conceiving an audience of peer faculty involved in review processes for Tenure and Promotion, it will synthesize the emergent realm of scholarly publishing that is often referred to as the digital humanities, digital scholarship, or digital storytelling. It will provide a detailed annotated resource list, pointing faculty to specific tools useful for oral history work using narratives, archival sources and imagery, fieldwork notes, and multimedia. This resource will be integrated into case studies published in the resource hub, becoming a tactical primer for course planning and programmatic outcomes of oral history/digital storytelling work. Examples of tools discussed will include StoriesMatter, PopUp Archive, the Oral History Metadata Synchronizer, DeDoose, and the Internet Archive’s open source, cloud-based repository capacities. 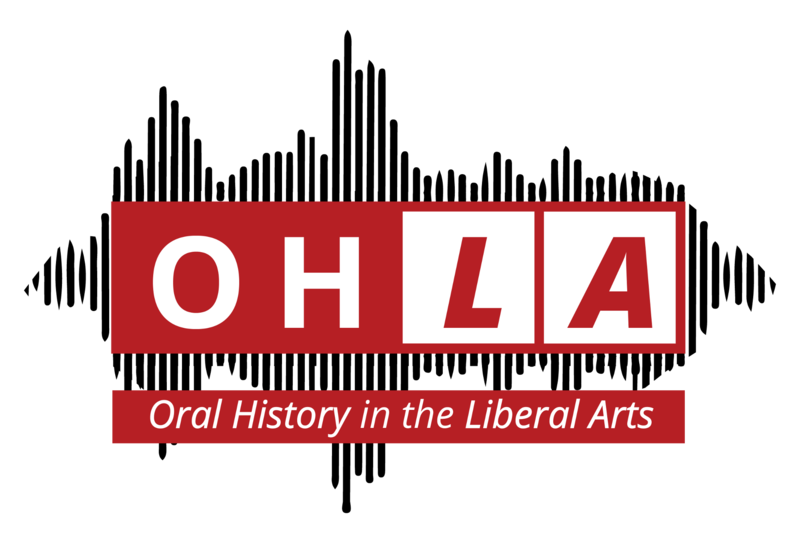 The OHLA Resource Hub will also serve as an index to oral history collections across the GLCA. This will serve a pedagogical purpose in demonstrating how different choices may manifest in the final project. It will also increase the visibility of the pilot and ongoing projects as community and scholarly resources. GLCA-affiliated institutions maintain varying levels of support services and infrastructure for archiving the raw media and/or finished productions of oral history and digital storytelling. Many campuses have narrow collection foci that preclude robust repository opportunities for field-recorded media at the curricular level— whether the raw media or finished projects are collected and produced by students or faculty. As such, liberal arts educators and students often struggle to not only archive their research and finished products, but also to utilize existing digital tools for oral history analysis and publication that require strategies for storing and moving media files. To address this issue, OHLA will develop and disseminate alternative repository protocols in the form of digital workflows that will ultimately allow liberal arts educators to incorporate oral history into their pedagogy in a more robust and sustainable way. Digital workflows offer clear instructions and best practices for utilizing and combining existing digital tools (e.g., open source archival platforms and content management systems) to address a specific technological need— in this case, insufficient repository access. Disseminating detailed example workflows with their benefits and drawbacks will make it substantially easier for interested faculty to conceive of and execute successful oral history projects. We expect that faculty will choose different products due to their project goals and available campus resources. For this reason, the OHLA resource hub will include a series of guides designed to walk faculty and professional staff through these choices. As demonstration projects return results, OHLA may be able to identify opportunities for GLCA institutions to save money and standardize workflows through consortial purchases or licenses. Editor’s note 12/17/15: OHLA is funded! This is the executive summary of the OHLA proposal, written by project lead Brooke Bryan with the help of the entire OHLA team. Faculty at GLCA-affiliated liberal arts colleges may join the project as authors or project leads, and can expect chief academic officers to circulate a call for proposals in spring term. We’re currently seeking ways to involve faculty within other consortiums. If you are faculty or instructional staff using oral history & digital storytelling to teach and learn in a liberal arts environment, we’d love to hear from you. We’re a faculty collective working to animate our teaching & learning through community-based inquiry. Thanks to the Great Lakes College's Association's 'Expanding Collaboration Initiative' and the generous support of the Andrew W. Mellon Foundation, we're stewarding micro-funding through the 13 campuses of the GLCA from 2016 through 2019. Interested in digital storytelling and digital scholarship that employs interview methods in a community-centric landscape of best practices? We're busy compiling a toolkit of digital tools, workflows, archival options, and pedagogical support. Sign up for our emails for access to resources as we create them!